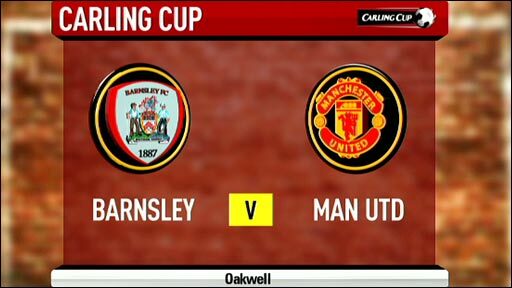 Carling Cup holders Manchester United booked a quarter-final place thanks to a comfortable 2-0 victory at Barnsley. Sir Alex Ferguson made 11 changes from United's defeat by Liverpool on Sunday and they went ahead when Anderson's corner was headed in by Danny Welbeck. Barnsley went close when Daniel Bogdanovic hit the post, but Michael Owen's expert finish doubled the lead. Gary Neville was shown a straight red card for a challenge on Adam Hammill, but Barnsley could find no way through. They had enough chances to get back on level terms, but some profligate finishing cost them any chance of a famous upset at Oakwell. The match was marred by crowd trouble and South Yorkshire police said 10 fans were arrested. Eight catering staff were trapped inside a food kiosk and had to barricade themselves in a store room for about 25 minutes as fans broke in and stole cash from the till and food from the shelves. Stewards on the pitch also had objects thrown at them. The game itself was the perfect opportunity for Ferguson to give some of his senior players who have not been playing regularly in the first team some much-needed competitive football. Neville and Wes Brown came into the defence, Anderson was brought into the midfield and Owen started only his fifth game for the club, while Gabriel Obertan made his first start since a £3m summer move from Bordeaux. Much of the pre-match talk had been about Ferguson coming up against Barnsley boss Mark Robins, the man credited with saving his job when he scored for United in the 1990 FA Cup third round tie at Nottingham Forest. But Ferguson's side showed Barnsley no mercy in a dominant opening spell as Welbeck thumped home a header with only six minutes on the clock. It could quickly have got worse as both Welbeck and Obertan forced fine saves from Luke Steele, the first chance coming after an outrageous 60-yard pass from the influential Anderson. Barnsley were perhaps guilty of giving United too much respect, but they soon improved and Bogdanovic nodded against a post before Stephen Foster twice headed off target from good positions as United consistently failed to deal with corners. The hosts were beginning to look like the better side, but they had not accounted for the predatory finishing instincts of master goal-scorer Owen. Having sliced one effort wide early in the second half, he made the Tykes pay with a stunning solo goal on the hour mark. Owen rolled back the years as he picked the ball up outside the Barnsley area, slipped it through a defender's legs and surprised Steele by taking his shot early, clinically rolling it into the far corner from 16 yards. It was a magnificent finish, but United were not quite home and dry as captain Neville - to his absolute horror - was shown a straight red card by referee Chris Foy for a tackle on Hammill. Neville had won the ball in the initial challenge, but Foy ruled the follow through in which he caught Hammill just below the knee on his right leg constituted serious foul play. The dismissal gave Barnsley and their supporters a lift just when they least expected it, but despite creating a glut of chances they could not put the ball in the net to set up a grandstand finish. Substitute Iain Hume headed wide moments after coming on, Bogdanovic shot wide from 12 yards and then Anderson de Silva headed off target with the goal at his mercy from four yards. United roll on to the last eight, while Barnsley head for Peterborough on Saturday in the Championship and a meeting with Ferguson's son Darren. "I'm disappointed. We must have had between 15 and 17 efforts on goal, but when you don't take one of them you don't deserve to win the game. "I think we paid them too much respect at the start of the game, we were lacking a bit of belief at times. "But not many teams will create that many chances against Man United." "Michael has got great feet, so quick, and it was a marvellous finish. I'd say it was a great goal. "Barnsley worked hard and put a lot of effort in, they had some chances too, but we probably deserved to progress." On Gary Neville's red card, he added: "He followed through, in the current climate you can see why it's given." 90:00+3:37 The game is over, as the referee blows his whistle. Correction - 90:00+2:38 Zoran Tosic decides to take the corner short. 90:00+2:38 Corner taken short by Zoran Tosic. 90:00+1:49 Foul by Jamal Campbell-Ryce on Fabio Da Silva, free kick awarded. Free kick taken by Oliveira Anderson. 89:36 Adam Hammill takes the inswinging corner, Adam Hammill takes a shot from just inside the penalty box which clears the crossbar. 88:59 Direct free kick taken by Robert Kozluk. 88:59 Booking Zoran Tosic receives a yellow card for unsporting behaviour. 88:54 Free kick awarded for a foul by Zoran Tosic on Stephen Foster. 87:47 Free kick awarded for a foul by Adam Hammill on Rafael Da Silva. Direct free kick taken by Ben Foster. 87:09 Oliveira Anderson takes a shot. Save by Luke Steele. 85:59 Daniel Bogdanovic is ruled offside. Indirect free kick taken by Ben Foster. 82:59 Strike on goal comes in from Iain Hume from the free kick. 82:59 Booking Fabio Da Silva is cautioned by the ref for unsporting behaviour. 82:55 Fabio Da Silva challenges Jamal Campbell-Ryce unfairly and gives away a free kick. 82:19 Adam Hammill takes a shot. Ben Foster makes a comfortable save. 81:20 The assistant referee signals for offside against Federico Macheda. Luke Steele takes the free kick. 80:52 Free kick awarded for a foul by Daniel Bogdanovic on Oliveira Anderson. Fabio Da Silva takes the direct free kick. 79:05 Daniel Bogdanovic is ruled offside. Indirect free kick taken by Ben Foster. 78:27 Jacob Butterfield has a drilled shot. Brilliant save by Ben Foster. 76:57 Foul by Zoran Tosic on Jamal Campbell-Ryce, free kick awarded. Free kick crossed right-footed by Iain Hume, Jonathan Evans manages to make a clearance. 76:21 Substitution Jacob Butterfield is brought on as a substitute for Hugo Colace. 75:17 Adam Hammill takes a shot. Save by Ben Foster. 73:37 Adam Hammill produces a cross, Wes Brown makes a save. 73:20 Short corner taken by Adam Hammill. 72:06 Wes Brown restarts play with the free kick. 72:06 Booking Daniel Bogdanovic shown a yellow card. 72:02 Foul by Daniel Bogdanovic on Rafael Da Silva, free kick awarded. 70:00 Substitution Jamal Campbell-Ryce on for Anderson De Silva. 70:00 Daniel Bogdanovic takes a shot. Ben Foster makes a save. Outswinging corner taken right-footed by Iain Hume, Header from close in by Anderson De Silva misses to the left of the target. 67:58 Free kick awarded for an unfair challenge on Rafael Da Silva by Emil Hallfredsson. Free kick taken by Wes Brown. 67:10 Header from close in by Iain Hume misses to the left of the goal. 66:21 Free kick awarded for an unfair challenge on Fabio Da Silva by Daniel Bogdanovic. Fabio Da Silva restarts play with the free kick. 64:36 Substitution Michael Owen leaves the field to be replaced by Ritchie De Laet. 64:36 Substitution Iain Hume on for Jonathan Macken. 64:22 Daniel Bogdanovic produces a right-footed shot from just outside the penalty box that misses to the left of the goal. 62:08 Gary Neville challenges Adam Hammill unfairly and gives away a free kick. Luke Steele takes the free kick. 62:08 Sent off Gary Neville is sent off. 61:24 Gabriel Obertan takes a shot. Blocked by Darren Moore. Oliveira Anderson takes a inswinging corner. 58:49 The assist for the goal came from Oliveira Anderson. 58:49 GOAL - Michael Owen:Barnsley 0 - 2 Man Utd Michael Owen finds the back of the net with a goal from inside the area to the bottom right corner of the goal. Barnsley 0-2 Man Utd. 57:01 Zoran Tosic has an effort at goal from just outside the box which goes wide of the left-hand upright. 55:01 Free kick awarded for a foul by Jonathan Macken on Wes Brown. Gary Neville restarts play with the free kick. 53:47 Effort from the edge of the area by Anderson De Silva goes wide of the left-hand upright. 52:30 Free kick taken by Darren Moore. 52:30 Substitution Zoran Tosic on for Danny Welbeck. 52:30 Federico Macheda concedes a free kick for a foul on Robert Kozluk. 50:30 The ball is crossed by Jonathan Macken, clearance made by Gabriel Obertan. 47:51 Michael Owen produces a left-footed shot from deep inside the penalty box which goes wide of the left-hand upright. 43:10 Free kick awarded for an unfair challenge on Gabriel Obertan by Emil Hallfredsson. Direct free kick taken by Fabio Da Silva. 42:50 Corner taken right-footed by Adam Hammill from the left by-line, Ben Foster makes a save. 42:42 Daniel Bogdanovic delivers the ball, Gary Neville manages to make a clearance. 41:15 Corner from left by-line taken by Adam Hammill. 40:23 Fabio Da Silva challenges Anderson De Silva unfairly and gives away a free kick. Direct free kick taken by Anderson De Silva. 39:02 Fabio Da Silva takes the direct free kick. 39:02 Booking Hugo Colace booked for unsporting behaviour. 38:56 Gabriel Obertan fouled by Hugo Colace, the ref awards a free kick. 37:37 Direct free kick taken by Ben Foster. 37:37 Booking Anderson De Silva is shown a yellow card. 37:20 Adam Hammill sends in a cross, Ben Foster fouled by Anderson De Silva, the ref awards a free kick. 36:50 Adam Hammill delivers the ball, Wes Brown manages to make a clearance. 36:19 A cross is delivered by Gabriel Obertan, Header on goal by Danny Welbeck from inside the box goes harmlessly over the target. 34:59 The ball is sent over by Robert Kozluk. 34:29 Outswinging corner taken from the right by-line by Adam Hammill. 31:52 Corner taken left-footed by Oliveira Anderson from the right by-line to the near post, Hugo Colace manages to make a clearance. 31:06 Foul by Hugo Colace on Oliveira Anderson, free kick awarded. Oliveira Anderson takes the direct free kick. 29:48 Adam Hammill takes a shot. 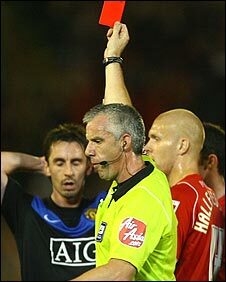 Gary Neville gets a block in. Headed effort from deep inside the penalty area by Anderson De Silva goes harmlessly over the crossbar. 28:07 Free kick awarded for an unfair challenge on Rafael Da Silva by Jonathan Macken. Gary Neville takes the direct free kick. 25:48 Corner taken by Adam Hammill from the left by-line, Stephen Foster has a header from close range and clears the crossbar. 23:54 Corner taken right-footed by Adam Hammill, Headed effort from inside the area by Stephen Foster misses to the right of the goal. 23:43 The ball is crossed by Robert Kozluk, clearance made by Rafael Da Silva. 22:24 Inswinging corner taken from the left by-line by Adam Hammill, Header from close range by Daniel Bogdanovic hits the post. 20:28 Anderson De Silva produces a right-footed shot from outside the penalty area and misses left. 19:52 Free kick awarded for an unfair challenge on Darren Moore by Federico Macheda. Free kick taken by Luke Steele. 19:09 Adam Hammill concedes a free kick for a foul on Gabriel Obertan. Wes Brown restarts play with the free kick. 18:36 Gabriel Obertan takes a shot. Brilliant save by Luke Steele. 16:52 Jonathan Macken concedes a free kick for a foul on Jonathan Evans. Free kick taken by Ben Foster. 15:43 Robert Kozluk fouled by Danny Welbeck, the ref awards a free kick. Luke Steele takes the free kick. 15:17 Federico Macheda takes a shot. Blocked by Darren Moore. 14:41 Shot from just outside the area by Adam Hammill goes over the bar. 10:24 Corner taken by Oliveira Anderson from the left by-line played to the near post, Darren Moore makes a clearance. 10:15 Centre by Fabio Da Silva, Stephen Foster manages to make a clearance. 9:19 Danny Welbeck takes a shot. Save by Luke Steele. 6:43 Unfair challenge on Gabriel Obertan by Emil Hallfredsson results in a free kick. Oliveira Anderson takes the free kick. 5:38 Assist on the goal came from Oliveira Anderson. 5:38 GOAL - Danny Welbeck:Barnsley 0 - 1 Man Utd Danny Welbeck grabs a headed goal from close in. Barnsley 0-1 Man Utd. 4:14 Outswinging corner taken by Oliveira Anderson from the left by-line, Darren Moore makes a clearance. 1:07 Free kick awarded for a foul by Michael Owen on Emil Hallfredsson. Robert Kozluk crosses the ball in from the free kick, save by Ben Foster.